Four Riders enter the Shire before dawn. The others pursue the Rangers eastward, and then retrun to the Greenway. A Black Rider comes to Hobbiton at nightfall. Frodo leaves Bag End. Gandalf having tamed Shadowfax rides from Rohan. The hobbits do an evening march in the Green Hill Country. September 23, TA 3018 is one of those calendar dates when nothing else will do but the words of the Professor himself. The events of this day contain some of the most memorable passages in the entire span of the LOTR books. Sometimes it is wiser to admit that one cannot embellish on the magnificent writings of a true master. Today is one of those days when we should let Tolkien speak for himself, and we shall. Four Riders enter the Shire before dawn. The others pursue the Rangers eastward, and then retrun to the Greenway. Gandalf having tamed Shadowfax rides from Rohan. A Black Rider comes to Hobbiton at nightfall. He turned to go back and then stopped, for he heard voices, just round the corner by the end of Bagshot Row. One voice was certainly the Old Gaffer's; but the other was strange, and somehow unpleasant. 'Good-bye' said Frodo, looking at the dark blank windows. He waved his hand, and then turned and (following Bilbo, if he had known it) hurried after Peregrin down the garden-path. They jumped over the low place in the hedge at the bottom and took to the fields, passing into the darkness like a rustle in the grasses. The hobbits do an evening march in the Green Hill Country. A mile or two further south they hastily crossed the great road from the Brandywine Bridge; they were now in the Tookland and bending south-eastwards they made for the Green Hill Country. As they began to climb its first slopes they looked back and saw the lamps of Hobbiton far off twinkling in the gentle valley of the Water. Soon it disappeared in the folds of the darkened land, and was followed by Bywater beside its grey pool. When the light of the last farm was behind, peeping among the trees, Frodo turned and waved a hand in farewell. 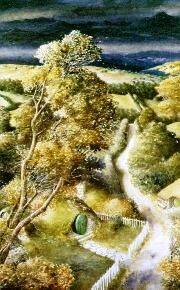 Tolkien's magnificent words describing the beautiful Shire belie the powerful events set in motion this day. The Enemy is at hand.